If you’ve spent even a few minutes on Greatist, it’s no secret we’re huge fans of avocados. (There’s even an avocado-shaped piñata in our office!) There’s good reason, too: Avocados are a great source of monounsaturated fat (which can improve cholesterol levels, decrease risk of heart disease, and benefit brain function), vitamin E (a powerful antioxidant), and vitamin B6 (which promotes healthy skin and serves as a back-up fuel)  . Plus, they’re just darn delicious (kale salad with avocado and grapefruit, anyone?). Just remember not to overdo it — this fruit is pretty heavy and high in calories, it’s probably best to consume no more than about half a fruit per day. It’s hard to beat beets. First off, let’s talk about that color: Beets are high in betalain, an antioxidant that gives them that purple hue and may help ward off cancer and other degenerative diseases . Vitmains A, B, and C offer additional benefits ranging from bolstering the immune system to helping the body produce collagen . A healthy dose of potassium, which is essential for proper organ function, and fiber, which keeps the digestive tract regular and helps maintain heart health, help round out beets’ nutrition profile. These little seeds may have gained fame as the base of the 90s chia pet craze, but they offer oh so much more as a superfood. Chia seeds are packed with magnesium, iron, calcium, and potassium. 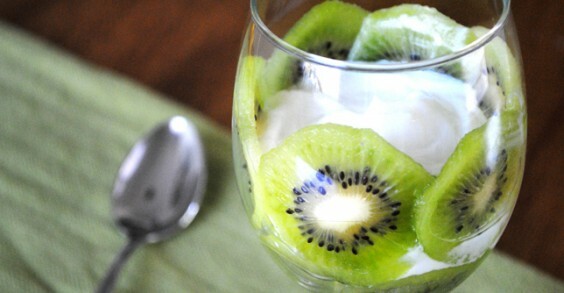 Plus, they’re perfect for adding to smoothies, yogurt, and pudding. The little seeds can absorb up to 10 times their weight in water, which some studies suggest can help the body stay hydrated longer and may improve overall endurance . Dates are great for a few reasons. First off, they’re a perfect healthy recipe substitution for both sugar and/or butter in baking. They’re also packed with fiber (which is essential for good heart and digestive health) and vitamins and minerals including potassium, selenium, copper, and magnesium . 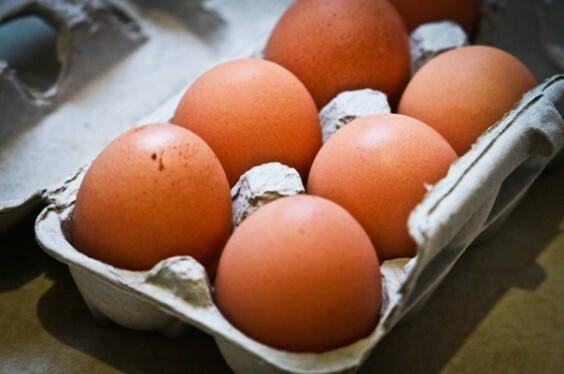 Eggs are one of the best superfoods because you get a good serving of protein in an inexpensive little package. Just 70 calories and 6 grams of protein, eggs are also rich in omega-3 fatty acids, which help with proper body function and heart health. They’re good for the eyes, too: The antioxidants lutein and zeaxanthin (found in the yolks) help protect the eyes from light and free radicals (and may even help prevent eye degeneration that can present with age) . And while there’s been much debate about the health of those lil’ yellow centers (some say their cholesterol content is bad news bears), the yolks are full of choline, a B vitamin essential for proper brain function  . Besides their crazy-high fiber content, research suggests the omega-3s in these seeds can help lower cholesterol and reduce the risk of heart disease  . Itis important to note that the positive effects of flaxseed on cholesterol have been shown to be temporary, meaning they can wear off if regular (daily) consumption stops . Add the seeds (whole or ground) to baked goods, oatmeal, or a salad, and skip the flax oil, which may not have the same awesome cholesterol-regulating powers . Vitamins C and K, beta-carotene, and resveratrol are the health-benefit stars of this favorite super-fruit. These vitamins act as antioxidants in the body to help eliminate free radicals that can cause cellular damage . Resveratrol has made headlines for its potential to lower LDL cholesterol, help inhibit cancer cell growth, and treat cognitive impairment . The biggest benefit here comes from essential fatty acids and protein. Those fatty acids (including polyunsaturated fats and omega-3s) may help fight coronary heart disease, cancer, and even symptoms of depression . These little seeds aren’t lacking in vitamin and minerals, either — they’re high in magnesium, zinc, and iron. Gamma linolenic acid (aka GLA, also found in breast milk) also makes an appearance, adding a variety of benefits ranging from allergy defense, to helping treat attention deficit disorder, and even helping lower cholesterol levels . Here’s yet another superfood native to South America (along with goji berries and quinoa, to name a few!). Incan berries are packed with vitamins C and A, iron, niacin, and phosphorous. They’re also high in protein (especially for a berry!) and fiber. When eaten, they start off with a sweet flavor and finish with a bit of a sour twist. Jalapeños are packed with capsaicin, a compound found in spicy peppers that’s credited with speeding up metabolism and suppressing appetite  This magical compound also increases fat oxidation (so the body can more easily use fat as fuel) . Aside from containing a superhuman amount of vitamin C (243 percent of the daily recommended amount in just two fruits), kiwi is a fantastic source of folate, which is essential for overall cell health. Some studies suggest it may even reduce the risk of heart disease and colon cancer . It’s no secret that citrus fruits — like the mighty lemon — are packed with vitamin C, which is essential for the body to produce collagen (which helps keep blood vessels, tendons, ligaments, and bones healthy and strong. Plus, they’re filled with the antioxidants known as flavonoids, which may help reduce risk of heart disease, reduce inflammation, and fight some cancers  . (Citrus fruit and pancreatic cancer risk: a quantitative systematic review. Bae J.M., Lee E.J., Guyatt G. Department of Preventative Medicine, Cheju National University College of Medicine, Jeju, Jejudo, Korea. Pancreas, 2009 Mar; 38(2):168-74.)). To get the biggest benefits from these sour sweeties, pair withfoods high in iron (like leafy greens and red meat): Vitamin C helps the body absorb iron, too! Believe it or not, it’s the chocolate version of this cafeteria treat that’s touts some serious post-workout health benefits. Studies suggest that this delicious drink provides the optimal ratio of carbohydrates and protein for gym-goers to consume post-exercise. The research suggest that a chocolate milk fix could help improve performance, make for quicker exercise adaptation, and lead to better body composition . Giant bags of assorted nuts have been known to appear at the Greatist office regularly — and not just because they’re irresistibly delicious. The unsaturated fats in nuts are good for your heart, and some types (looking at you, almonds) can help lower blood pressure and body fat (when combined with a low-calorie diet) . Nuts are also a good source of protein, making them perfect for a healthy midday snack to keep you full longer. While they can be a bit high in calories, they’re also nutrient-dense, meaning that you get a big nutritional bang for your calorie buck! By now, the whole “whole-grains” thing is burned into all of our brains, right? Good news: Oatmeal, that unassuming, easy, delicious breakfast staple is a great source of whole grains. It’s that “whole” part that makes oatmeal a great source of fiber, which has been shown to help lower blood cholesterol, aid in digestion, and improve metabolism . While those instant oatmeal packets are certainly convenient, we recommend making your own at home to cut out any unnecessary sugar or additives (and so you can customize to your liking). This superfood goes way beyond the standard pie — you can enjoy its health benefits in oatmeal (see recipe above), roasted and served in a salad, or in baked goods. The orange flesh of these Fall favorites is rich in antioxidants and vitamins including beta-carotene (essential for eye health), fiber, and vitamin K (which may reduce risk for some types of cancer)  . But don’t stop with the actual meaty part of this gourd — the seeds are healthy, too. One ounce (about 140 seeds) is packed with protein, magnesium, zinc, and potassium, and studies suggest pumpkin seeds could help prevent enlargement of the prostate gland, lower the risk of bladder stones, and help prevent depression   . It may look like rice or couscous, but this mildly nutty, grain-like staple is actually a seed related to green leafy vegetables like kale and Swiss chard. Quinoa (pronounced KEEN-wa) is one of the only grains or seeds that provide the nine essential amino acids our bodies can’t produce themselves . These peppery, crunchy little beauties come in a few varieties, from white (also called daikon), to red, to (wait for it) watermelon! 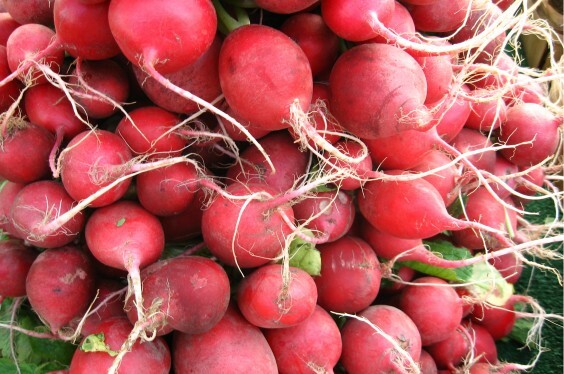 Some studies suggest certain compounds in radishes may be able to help stop the growth of some cancers (including breast cancer) . More research suggests another compound found in radishes, anthocyanins (also found in cherries), may help prevent some cancers and even aid in muscle recovery after a tough workout (though this research is based on anthocyanins in cherries, not radishes)  . There’s nothing fishy about the health benefits of this seafaring superfood. Salmon is full of healthy omega-3 fatty acids, which studies suggest can help reduce the risk of cardiovascular disease . Those trusty Omega-3s may also help protect skin from UV-induced damage . Tea is undoubtedly one of the go-to beverages in the Greatist office, and it’s this ancient tonic’s health benefits that keep us steeping more and more! From boosting endurance to reducing the risk of cardiovascular issues and (potentially) a bunch of cancers (including breast, colon, skin, and lung, to name a few), tea leaves are a great way to stay hydrated and healthy at the same time. Plus, some research suggests green tea could help prevent some types of skin cancer, while black tea may help cure those annoying sunburns . Good news: you can’t really go wrong with vegetables. Regardless of the variety you choose, they’re going to have at least a handful of redeeming qualities, from high levels of vitamins and minerals to a good dose of fiber.Green veggies are a great source of iron and calcium; red veggies are usually packed with lycopene and anthocyanins; and allium veggies like garlic and onions are full of antioxidants (which can help protect against free radical damage to the body’s cells (and especially the skin)  . With just 48 calories per cup and packed with water, this refreshing fruit makes for the perfect healthy snack mid-summer (or any time of year). It’s low in sugar, and high in vitamins A and C, as well as the amino acid citrulline, which help the body produce another amino acid, arginine. Arginine can help lower blood pressure and reduce the risk of cardiovascular disease  . This melon’s also a great source of lycopene, the super-healthy essential amino acid found in tomatoes, that studies suggest can protect the body from UV rays, cardiovascular disease, and some forms of cancer  . First, let’s get one thing straight: Yams and sweet potatoes are not the same thing (though, yes, sweet potatoes are also a superfood). These tubers are low on the glycemic index, meaning that they can be consumed without negatively affecting blood sugar levels, making them a great food to eat for sustained energy. On top of that, yams are a great source of fiber, vitamin B6, potassium, and manganese, which are key for things like proper production of serotonin, nervous system function, and wound healing  . Come July and August, zucchini’s a staple on most grocery store shelves. The best part? It can be used perfectly in both sweet (think zucchini bread) and savory (think simply grilled) dishes. This green-skinned veggie is packed with vitamins C and B6, potassium, manganese, and folate. Plus, it’s low in calories (just 20 per cup!) and has a high water content, so it’s great for hydrating in the summer heat, too.